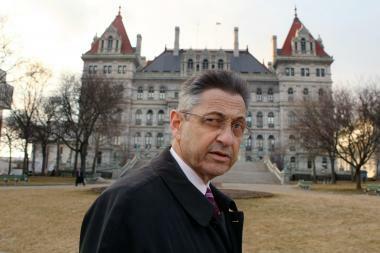 Assemblyman Sheldon Silver in front of the Albany statehouse he ruled for two decades. NEW YORK — Federal investigators have begun wiretapping a new set of potential targets as a result of the probe that led to the indictment off former Assembly Speaker Sheldon Silver, DNAinfo has learned. Investigators in the U.S. Attorney's office and the FBI obtained court authorization to eavesdrop on an ever-expanding group of possible corrupt government officials and those who do business with them, including lawyers, lobbyists and contractors, sources said. The targets came to light during the two-year investigation of the powerful state Assembly leader — during which federal corruption fighters found “numerous new tentacles” to pursue, sources said. The feds did not utilize wiretaps on Silver as part of the investigation that led to the indictment of the 72-year-old Manhattan lawmaker. But federal authorities were "already listening to numerous people in various places" on unrelated investigations before looking into Silver, and his "case provided a bunch of new places to wiretap,” a law enforcement source told "On The Inside." The revelation that there is a new wave of federal eavesdropping from the speaker’s probe is certain to rattle an already-anxious Albany, where dozens of lawmakers have been convicted on corruption charges, many of them secretly caught on tape. In recent years, secret recordings and wiretaps have helped nail lawmakers on corruption-related charges including state Sen. Malcolm Smith, Councilman Daniel Halloran, Assemblyman Eric Stevenson and Assemblyman Nelson Castro. “Stay tuned,” Manhattan U.S. Attorney Preet Bharara warned state legislators after announcing Silver’s indictment in February. Silver, who ruled the Legislature with an iron fist for the past two decades, was charged with taking bribes and kickbacks, using his office to obtain nearly $4 million in corrupt payments from two law firms over the past 15 years. The speaker allegedly steered real estate developers to a small law firm that paid him kickbacks disguised as “referral fees.” He also allegedly steered state grants to Dr. Robert Taub, the director of Columbia University's Mesothelioma Center, who referred asbestos claims to a law firm where Silver was listed as “of counsel,” according to a criminal complaint and sources. Sources said wiretaps were not needed in the Silver probe because Dr. Taub and others cooperated with the feds not long after being confronted with evidence of possible wrongdoing. In addition, public records and Silver’s disclosure forms provided evidence that he allegedly attempted to hide the scheme by not revealing the income. “His case did not really need any eavesdropping,” another source explained. Feds argue in Silver’s indictment that he tried to block Cuomo’s corruption commission — the Moreland Commission — from obtaining information about his outside income. The panel was created in 2013 but was shut down by Cuomo nine months later before it could finish its investigation. The Manhattan U.S. Attorney has taken over the files from the shuttered commission and is probing allegations of wrongdoing involving several state officials and lawmakers, and whether officials broke the law impeding the commission's work. A few weeks ago, Silver’s son-in-law Marcello Trebitsch, 37, of Brooklyn, was charged in an unrelated Ponzi scheme in which he allegedly stole millions of dollars from investors while fraudulently claiming double-digit gains, a move reminiscent of Bernie Madoff’s scam. Prosecutors are also reportedly eyeing the son of Senate Majority Leader Dean Skelos for his financial ties to an embattled chemical company that won a lucrative contract with Nassau County even though it was not the lowest bidder.